Do I need any qualifications for any of the races? Yes. Only the 160km runners will have a pacer option. Pacers can be picked up at the farm for the last 60km section. Note: “muling” is prohibited. This means that your pacer cannot carry any gear for you. Is there any mandatory gear requirements? Is there a drop bag service? Yes. We’ll let you know (well in advance) where you can have drop bags and how to label/package them up. Please read “The Fine Print” under the registration tab. How long can I camp out for at the farm? Free camping is available Friday, Saturday and Sunday night. Friday night we’ll be offering up some sweet eats that are included in the registration fee. Exact menu to be announced before the event, but there will be meat and veggie options only. You will be treated to spectacular scenery all over this course!! 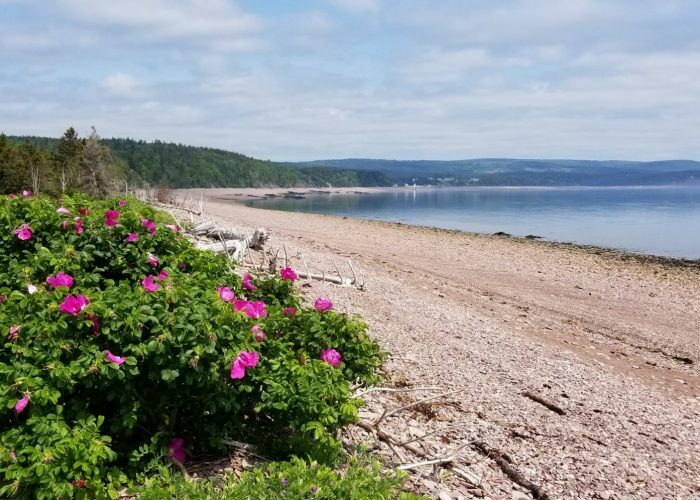 Stunning beaches, the highest cliffs on mainland NS, the world’s highest tides, well maintained and fun trails, brooks, rivers, fields and more! The bulk of the course is made up of really well maintained ATV/snowmobile trails. On the longer courses (not the 50k), you’ll be treated to 22+kms of beautiful singletrack in Cape Chignecto Provincial Park…with a few steep hills along the way (the steepest on the whole course). The 100 milers will have to contend with their longest climbs and descents in the last 60k, which is on a section that only the 100 milers will do. Can my crew access any aid stations and where do the relay teams tag their runners? 50k crews can access all 3 aid stations. 100k crews can access 4 of the 7 aid stations. 160k crews can access 6 of the 13 aid stations. Relay teams will tag their runner in Advocate Harbour (end of leg 1), Advocate Harbour again (after leg 2), the farm/start/finish (end of leg 3) and Baisly’s aid station at the end of leg 4! Who is organizing the Capes 100? Is it their first event?? Surprise! We’ve been organizing races since 1995! We’ve organized everything from relay races to orienteering races to 24hr adventure races to ultramarathons! We’re the only group in Atlantic Canada that has been hosting a yearly trail running series…since 2011! Our well known “Nova Scotia Trail Running” series is sponsored by Salomon and our courses are known to be very well marked and the events are all very well organized! You’re in good hands 🙂 Hope to see you there!! 2019 Capes 100, Nova Scotia Trail Running.